It’s very rare to come back from a holiday and feel physical want to be there, especially at my age. Also as a travel writer, I’ve travelled a lot and spent much time abroad, so it’s not unusual to go away and experience new and exciting things. But being away doesn’t necessarily equate having a superior experience than being at home. In fact, often quite the opposite is true. Unless you’re in Sölden. This was my fourth time in the Austrian ski resort- my three previous trips taking place between 1999 and 2003 and I vowed to go back, but as with many things, life got in the way. 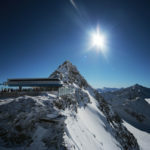 For the uninitiated, Sölden, which offers some of the highest skiing in Europe and was used as a location for the James Bond movie Spectre sits at 1400 meters above sea level at the southern end of the Ötztal valley, where Ötzi the 3300 B.C. mummy was found frozen in ice in 1991. Around 80 kilometers from Innsbruck, it is home to 144 kilometers of slopes stretching from 1,350 meters up to the twin glaciers at a high point of 3,250 meters. The resort features 31 lifts in all. 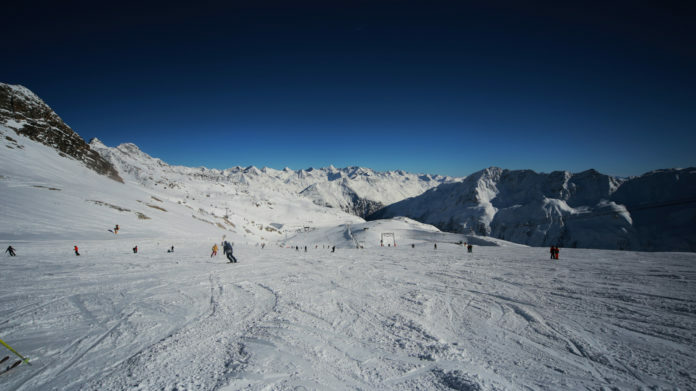 You can also make your way to Obergurgl, which sits at the end of the valley, offers joint lift tickets with Sölden. 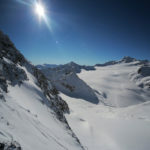 Tiefenbach Gletscher features broad blues, ideal for beginners and those who want to take it gingerly, while Rettenbach, which has been home to the World Cup circuit since the 2000-2001 season, has more challenging terrain. Lookouts on the Gaislachkogl, Tiefenbachkogl and Schwarze Schneid peaks, all more than 3,000 meters high, offer sweeping views of the Ötztal Alps. Around 20 percent of the slopes are designated to advanced skiers, even though off piste is always an option, especially around the Gaislachkogl mountain. To my shame, I didn’t do much of the above. It was snowing on the first two days, so we didn’t over exert ourselves. Unlike my first ski trips in the 1990s where I was going down black runs face first and inflicting permanent scars on my person, I’m in my 40s now and have nothing to prove. Also its come to my attention that when I fall over, I can’t actually get up again. Luckily on the third day, the sun came out. The conditions were blindingly good and we redeemed ourselves for the previous days mediocre performance. The difference in experience between a good day and a bad one is immense. We had to tear ourselves away from the slopes to get two flights home, still in our ski clothes, which remained on until we got to our respective beds. Some of us woke up in them the next day- in Ireland. Unlike any other foreign sojourn, skiing is best done in groups of like minded people and possibly those who are at your level, ski and apres ski wise. I’ve travelled the world on my own, but skiing is a joint effort. Who you go with is pertinent. The wrong person and is torture. Luckily this wasn’t the case this time and it didn’t take much to convince my friend to come. We hadn’t been skiing together since Ischgl in 2009 and 2010 respectively so it was overdue. We laughed from beginning to end. 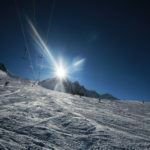 In my humble opinion a ski holiday is far superior to a sun holiday and one I would favour each year. Sitting by a pool is colossally dull, so skiing reigns supreme. I was rather happy to come for four days skiing, and three nights of partying. This way, we would keep our momentum up. So we flew from Dublin to Frankfurt at 5am on the Friday, then onto Innsbruck with a propellor plane over the Alps. There we got picked up by a lovely chap holding my name from the Ötztaler shuttle bus service, who arrived punctually and drove us to Zwieselstein, only five minutes from Sölden playing my favourite early 1980s German music. After a nap, we went to town planning to ski for just an hour, but by the time we picked up our skis and ski hire, we had left it too late. The good people at Intersport ski rental were excellent and cheerful. They know what they’re doing and sorted us with suitable equipment. I particularly liked the fact that we could have a shot of Obstler, whilst waiting. Sölden is known for partying and German music, which I love, being German myself. I had fond memories the Philipp apres ski hut from my previous visits and was delighted to see that not only was it still there, but I got to hear the same music as 20 years ago. General fun, frolics and trips to the Fire and Ice Bar and Katapult nightclub followed on all nights. Sölden is not for staying in. If you want to stay in, you can go to France. It’s not the biggest ski resort in the world, and certainly expert skiers may favour St. Anton, which is more challenging or as glitzy as Courchevel, but I love it. The fun we had skiing, the people we met, the music, the drinks, the food, everything was perfect. It’s an incredibly friendly resort and everything from the shuttle transfers to getting cabs, to picking up skies is easy. Our three night holiday kept escalating, our last night out, being the best I’ve had in Sölden. 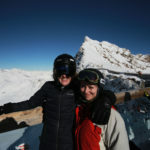 We met great people -mostly Germans and lovely generous Dutch gentlemen, who know how to ski and party and buy drinks. Seeing Milli Vanilli sing what we believe to be live also helped. Some things shouldn’t change and Sölden is one of them. I’ve skied in lots of places, but Sölden is one of absolute favourites. Every time I come, I never want to go home. Previous articleWhy haven’t we cashed in on Valentines Day?